Nancie, did you grow up with horses? Over the years my journey has been amazing. The little and big miracles I have witnessed. 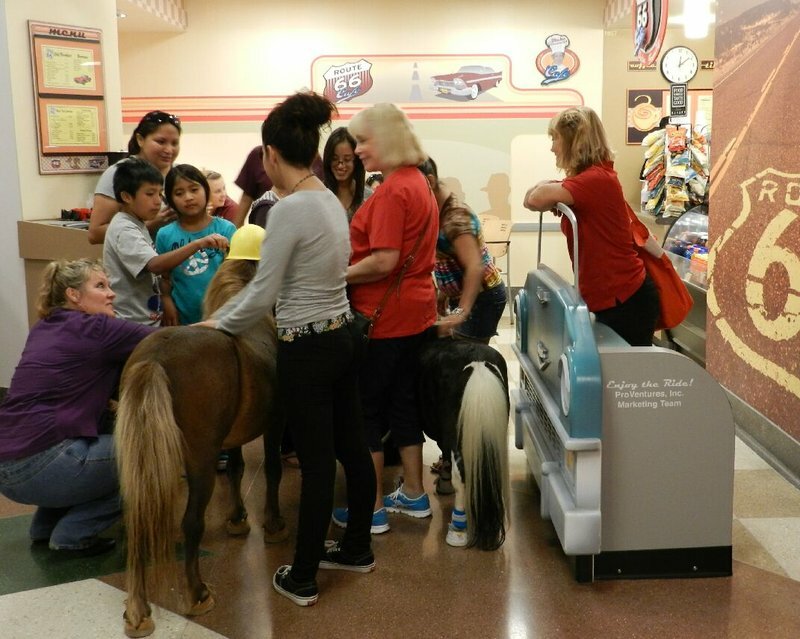 My herd has grown to help fit the need of the visits that we make and the visits have grown because of the need. I formed a Non Profit in 2005 because all of my profits brought in from the weddings went back into the gas tank to Travel the Miles to bring Smiles. Over the years I have been blessed with the help of lot of volunteers who are angels in themselves. Supporting the mission of Step Up Into T.L.C. and sharing my horses. Sometimes it’s the simple things in life that make a difference! For over eight years, Nancie Roahrig has been providing therapeutic support to children and adults with a variety of special needs. While helping people with special needs isn’t unique, the tools of Roahrig’s trade are unique. 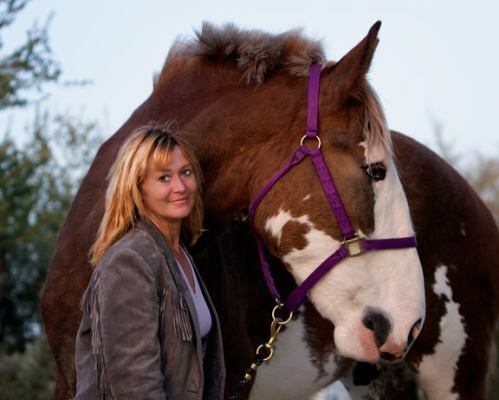 Her tools include a Percheron, a Clydesdale, an Arabian and two Shetland ponies. 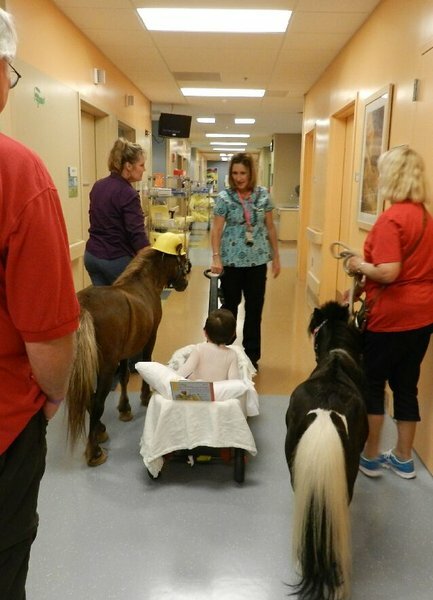 What these horses do is both surprising and a blessing to many. 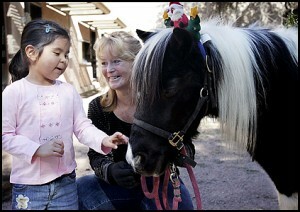 Nancie’s non-profit organization is called “Step Up to TLC” and the TLC part means Therapeutic Loving Caballos. The mission focuses on bringing smiles, fostering therapeutic healing, both emotionally and physically, and building self-confidence and social skills through people’s interaction with horses. Although her organization is not faith-based, Nancie firmly believes that the service she offers is “God blessed”. 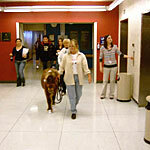 The larger animals are draft horses and often pull carriages and wagons at a variety of events. 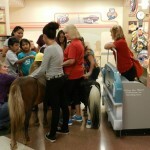 The ponies offer pony rides. 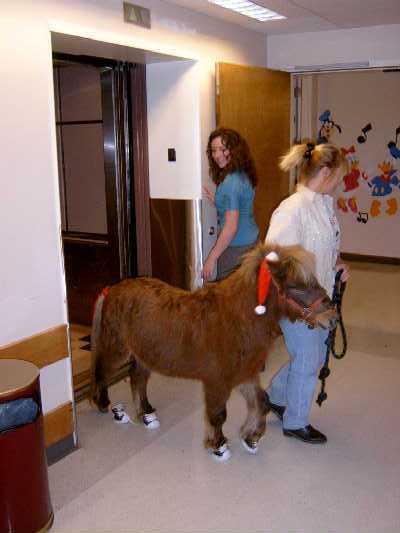 These activities help provide funds to sustain the real life work of the animals at schools, assisted living homes, pediatric wards and clinics where healing through touch and love is practiced. The animals seem to know their purpose. 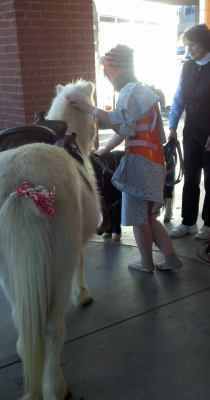 Nancie tells of a visit to Handmaker Assisted Living where the Clydesdale entered the lobby, much to the delight of the client guests. 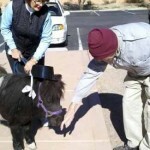 In another instance Mosey, one of the Shetlands, visited a former cowboy in Hospice care who had made a final request to see a horse again before he passed away. Mosey provided the answer to that wish right in the cowboy’s room. Nancie has experienced times when the interaction of child or adult to horse has brought out great emotions, but she states that, too, is a part of healing. 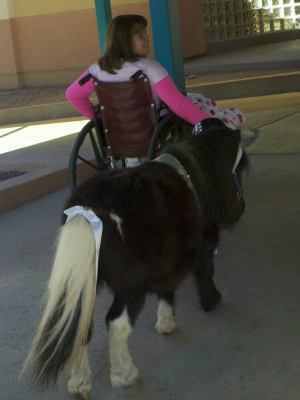 One of the most spectacular interactions she has observed was between one of the ponies and a child with autism. 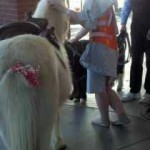 At first there was little awareness and then, with a nudge from the pony, an invisible veil was lifted. 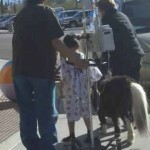 There was recognition and the passing of affection between horse and child as the child embraced the pony. Nancie asks for little as she foresees growth in her programs and activities. She could use some horse panels, misters, fans and some lumber to build armadas for shade for the animals. 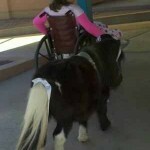 She is funded by private donations, foundations and grants and the “suggested donations” she collects from her carriage rides, pony rides and wagon trips. For more information or bookings, please contact Nancie at 400-7426. Do you remember when you were small? Did you like going to see that solemn-faced man in the white coat, the one who mumbled orders to you? “Open your mouth, say ah,” and I like this one, “this won’t hurt a bit just sit still.” Times have changed and so have our clinics and Doctors. 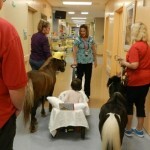 Even though the shots are still a necessity and they still bring tears to our eyes, and therapy can feel worse then running up and down stairs on a humid day, the atmosphere and bedside manner of the doctors have become a lot more pleasant for our young children, especially when one little, black and white pony is allowed to help make the medicine go down. 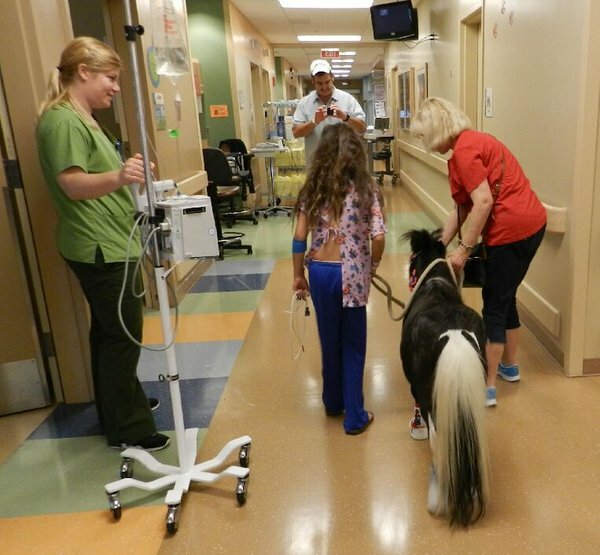 Once a month, our little pony, named Mosey, shares his time along with myself, if I am good, greeting the children as they come for their appointments at the Children Clinic for Rehabilitation and to Tucson Medical Center Pediatric Ward. 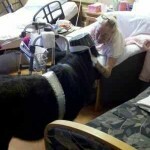 He provides a calming sensation while they gently pet him. He gives fun rides around the front patio for those who choose to do so. 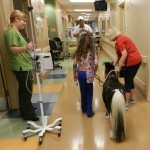 Pet Therapy is a wonderful catalyst in the children’s healing and therapeutic process. Mosey even gives some of the children rides to their car. We call this THE PONY EXPRESS! He has helped to cure the owies and stop the tears of some of the little patients that have had to undergo THE SHOT, pacifying without a pacifier. Oh yeah, the children love him and adults do too. We usually get a lot of the staff out to snuggle up to this little guy. 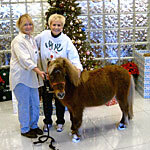 Mosey was a rescued pony. For the first five years of his life he was in and out of auctions. Being sold as a cute little gelding for some child only for the family to find out that he was still a stallion. An aggressive stallion at that. Mistreated, underweight and skin problems he was doomed until just by chance at one of the auctions a Rescue Horse Organization rescued him. This organization invested into gelding him, taught him some manners and brought him back to good health. I found out he was for sale and bought him and now have had the honor to watch him bring smiles as we have traveled the miles for the past six years giving rides to children at clinics, hospitals, hospice patients, birthday parties and special events around Tucson and it’s surrounding areas. This little guy really does have a purpose.